For his short program this season, Alex Krasnozhon is skating to a song called “Dancing on My Own” by Calum Scott. The program is also a fitting metaphor for his first full senior season, which starts this week at the Nebelhorn Trophy in Oberstdorf, Germany. Krasnozhon says he is “quite excited” to get back on competitive ice and has a positive outlook on last year’s season-ending ankle injury. “Before, I never took PT seriously, but now that’s something that I have to do in order to stay healthy. So that injury taught me a lot, and I think that the experience was a positive thing for me, in a sense,” Krasnozhon says. “It was physical pain and it was difficult emotionally. I was at PT every morning, every evening. And you know, you sit there and you do those exercises with the band and you just want to get on the ice and you want to work. So it was like, what do I do? How do I handle my emotions? And the path ahead includes Nebelhorn and his two Grand Prix assignments — his debut will be in Helsinki, Finland from November 2-4, and then he will compete at Rostelecom Cup in Moscow, Russia from November 16-18, 2018. Rostelecom Cup will be a return home for the Russian-born Krasnozhon, who has been representing the United States since 2015 and is in the process of getting his U.S. citizenship. His parents and two sisters still live there, and his dad hopes to attend the competition. Krasnozhon says he is aiming to finish in the top 5 or 6 at both his Grand Prix events and the U.S. Championships, with his sights set on a return to Junior Worlds or perhaps an assignment to Four Continents. Alex at the Junior Grand Prix Final with fellow American Camden Pulkinen, who won silver and Mitsuki Sumoto, of Japan, who won bronze. 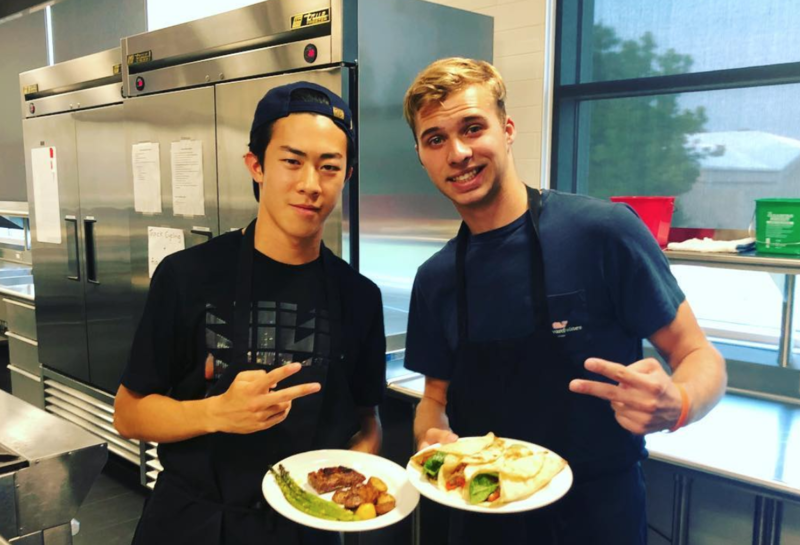 With his family still in Russia, Krasnozhon calls his friends from the rink in Texas his “skating family” and is particularly close with fellow U.S. men’s competitors Jimmy Ma and Tim Dolensky. And even though his family is across the globe, he says they talk on the phone every day and watch his performances online. 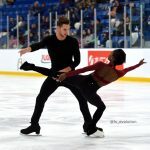 That sense of daring also comes in handy when he is trying quadruple jumps on the ice, and he has goals of putting three clean quads in his program for U.S. Nationals. 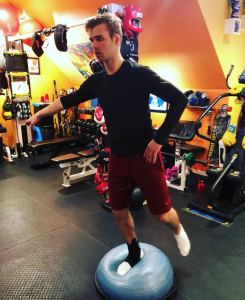 Until then, he and his coaches are focusing on the quad Salchow, which is his cleanest quad, and he doesn’t have any lingering fears from the injury at Junior Worlds. 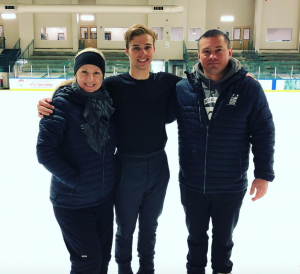 Krasnozhon credits his former coaches Darlene and Peter Cain with making him the skater and person he is today, and he is very thankful for all they have done for him. With new coaches Letov and Ganicheva, he is excited to go in a different direction and focus more on his jumps. His long program this year will be an extended version of last year’s short program, set to “Korobushka” by Bond. He started the season with a famous classical piece (Piano Concerto in A Minor by Edward Grieg) choreographed by Marina Zoueva, but with all the time off the ice rehabbing his ankle, there wasn’t enough time to perfect a brand new program, so they decided to rework last year’s short into a new long, choreographed by Scott Brown who originally choreographed last season’s short program. Even though he won’t be using the program they worked on together this season, Krasnozhon loved working with Zoueva. He attended U.S. Figure Skating’s Champs Camp for the first time this August, and took that as an opportunity to see how the country’s top skaters train. And he’ll get to put what he learned into practice this week at Nebelhorn, which he says will be an opportunity to “test the waters” before the Grand Prix series kicks off. You can follow along with Krasnozhon’s season on his social media accounts, @akrasnozhon on Twitter as well as Instagram, and learn more about his skating career on his official FSO site. 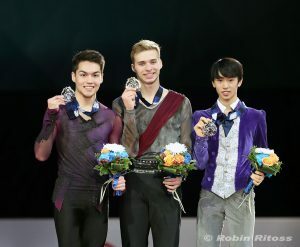 And keep up with results from this week’s Nebelhorn Trophy on our Twitter account, @FSOnline.